PCB Pre-heaters. Preheat for SMT, SMD, BGA. Lead-Free Solder Preheaters. Rework Pre-heat. The Originals! 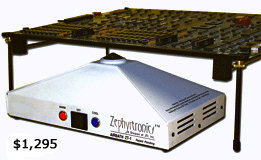 No One Knows More About PCB Preheating than Zephyrtronics With Our Trademark Pyramidal Designs! ALL PRE-HEATERS ARE NOT CREATED EQUAL. THE WIDEST PRE-HEATING LINE ON EARTH! • Affordable PCB Bottom Side Preheat. Far Superior to IR. • Analog Variable Temperature Control. • Self-Contained Air Supply, ESD Safe & RoHS Compliant. • 2° - 4°C Vital Industry Standard Temperature Ramp Rate. of the Cheap, Import Imitations on the Market. Yes, Double! • 15 CFM Bountiful Forced Convection Air Volume 430 Liters/Min. • Digital, Variable Closed Loop Temp Control With Digital Display! • 2° - 4°C Vital Industry Standard Temp Ramp  Rate. Compact In Size, But What Power & Air Volume! Three Times the Air Volume As All Other Small Preheaters! Analog Industrial AirBath™ PCB Pre-Heat : Powerful 25 CFM ! 800 Watt Power! • 25CFM Powerful Forced Convection Air Volume 712 Liters/Min. • Our Number One Selling Pre-Heater! 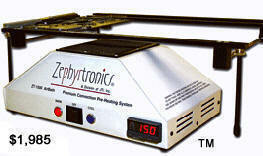 Digital Industrial AirBath™ PCB Pre-Heat : Powerful 25 CFM ! 800 Watt Power! • 25 CFM Powerful Forced Convection Air Volume 712 Liters/Min. BigGrid™ AirBath™ PCB Pre-Heat Series: Powerful 50 CFM ! 1,500 Watt Power! • 1st Choice of Aerospace & High End Firms! RoHS Compliant. MegaGrid™ AirBath™ PCB Pre-Heat Series: Powerful 50 CFM & 1,500 Watt Power! • Self-Contained Air Supply. Exceeds IPC connector specs! 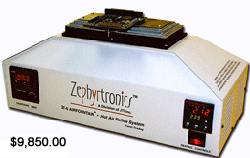 Aerospace 108 page Report Zephyrtronics AirBath™: "Given the advantages of lower temperatures for rework and results of this evaluation, use of this method and material for reworking SMT and difficult through-hole boards is recommended." Zephyrtronics Wins the Prestigious Vision Award for "Best New Product" at 1996 Surface Mount International Expo in Silicon Valley. 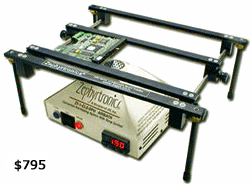 How Zephyrtronics Forever Changed the Way PCB's Are Made in the 1990's. 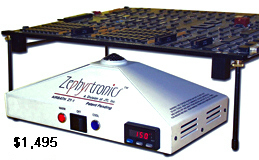 After the 1996 market introduction of their AirBath invention, Zephyrtronics received international recognition for its significant contribution to the electronic production world. For the first time in electronic manufacturing history, someone had finally addressed the most glaring discrepancy between the high quality, high volume production reflow processes and those typically found at the bench where prototyping, low-volume runs, rework or repair tasks are performed. Yes, we pioneered it. Long missing at the electronic work bench were the already long-established procedures like proper thermal profiling, ramping, preheating, low temp reflow and the cool down of the PCB yielding simply terrible results. Zephyrtronics changed that. And no one still knows preheating better than we do. The arrival of Zephyrtronics' first AirBath caused an immediate buzz within electronic manufacturing circles as word quickly spread about this amazingly simple, yet highly engineered little marvel and the dynamic quality it could produce. 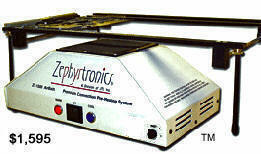 By 1997, the Editorial Staff of SMT MAGAZINE had witnessed the fever and singled out only three companies for the "noteworthy products" of 1997 writing, "Zephyrtronics' AirBath device for preheating is innovative....it's sensible approach should win it a place as a simpler, safer way to remove and repair sensitive devices." ©1996 - 2011, 2012, 2013, 2014, 2015, 2016, 2017, 2018, 2019 by Zephyrtronics®. All rights reserved. The information, text, images, photographs, charts, graphs you receive online from Zephyrtronics® are protected by the copyright laws of the United States. The copyright laws prohibit any copying, redistributing, retransmitting, or repurposing of any copyright-protected material. Zephyrtronics is the registered trademark property of JTI, Inc. "The Science of Zephyrtronics" and "Simplicity Through Innovation" and "Zephlux" and "ZeroLead" and "Zero Balling" and "Zero Residue" and "Post Cooling" and "Post Cooler" and "AirBath" and "SolderGlide" and "SolderMill" and "ZeroTouch" and "STILL Made in the USA" and "Just So Superior" are the protected trademark property of JTI, Inc. "Zephyrtronics" and "Low Melt" and "Air Fountain" and "Fountainhead" are the registered trademark properties of JTI Inc. *The above names are the registered property of their respective owners.